The Spring Boot Profiles YAML Properties example shows you how to use Spring Profiles based on YAML and Properties. Spring Profiles help developers to create multiple configurations details for different environments. 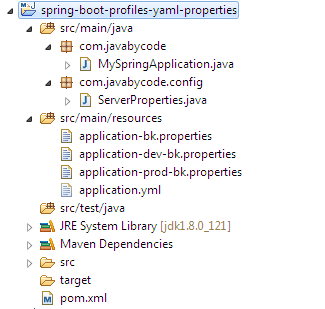 In Spring Boot, the default profile is default, we can set the profile via spring.profiles.active property. Multi profiles .yml example. In YAML, we can create multiple profiles by using a “—” separator. Read the properties or yaml files later. Don’t forget to create the Spring Boot Application. Go to the project directory, we package the jar file using the following command line. As you see the output above, our application is using the dev profile. Note: This demonstrates for the .yml file. Thus, the properties file is renamed to avoid conflicts. If you want to test .properties file, please rename it back to the correct syntax. That’s all on the Spring Boot Profiles YAML Properties example.